The percussive finger picking of ex. Plimsouls' Peter Case is the driving factor behind his ninth solo album, Bee Line. 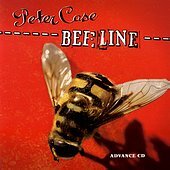 Possessed by a collection of songs that allow Case to really sing, Bee Line could be labeled a roots record, but could just as easily defy definition with its versatile sound. From the laid back note-to-self presentation of "Manana Champeen" to the tribal-folk-rock of "Ain't Leaving Your Love." Through the bare bones folk of "Lost in the Sky", and the swampy blues of "Evening Raga", Case crises and crosses through borders and boundaries, redefining and reshaping the sounds he touches upon. A storyteller at heart, Case uses his songs as a forum to tell a story, a book put to music, using his voice to write the words on your soul, forging paper to get to your heart quickly. Bee Line is one of his finest accomplishments, acknowledging that the former punk rocker has not lost a step in his wiser years. I'll give it an A-.